Summary. The experience of developed countries in market relations shows that the basis of the economy is the entrepreneurial activity of the country. Sting, intelligence activity provides a healthy competitive environment in the country. That is, competition in the field of entrepreneurship stimulates the development of all production processes prior to consumption. Competitiveness in entrepreneurial activity is associated with the introduction of innovations and their implementation. Competitive economic development of entrepreneurial activity in the manufacturing industry directly depends on the innovative development of the industry and its effective work. Innovative progress plays an important role in the economic development of the country's economy, including in the processing industry. The countries leading in this area have the opportunity to influence the improvement of the economic process. Key words: financial stability, monetary policy, privatization, state ownership, relative ratio. The Concept "Azerbaijan 2020: A Glimpse into the Future", "The State Program for the Development of Industry in the Republic of Azerbaijan for 2015-2000", "The Strategic Roadmap for the National Economy of the Prediction of the Republic of Azerbaijan" by the President of the Republic in recent years on the competitive development of entrepreneurial activities in the country, and a number of other laws, orders, decrees and development concepts. Strengthening financial stability and sustainable monetary policy in the country. Introduction of progressive reforms in privatization and state enterprises and achievement of high rates of development of the non-oil sector. Restoring production based on innovations, using the latest achievements in the field of human capital development and scientific and technological progress. Development of a favorable business environment and stimulation of entrepreneurial activity, achievement of competitive development of processing industry enterprises, etc. Successful implementation of strategic goals requires the creation of economic mechanisms that can assess the competitiveness of entrepreneurial activities in the manufacturing industry, allowing to determine the competitiveness of the industry as a whole. Here is the productivity of the enterprise. 1.1. Cost per item (man); 1.2. Funding (thousand man. ); 1.3. Product profitability (%); 1.4. Labor productivity (thousand man./adam). Financing of the enterprise.2.1. Frequency coefficient.2.2. Payment coefficient.2.3. Absolute liquidity ratio.2.4. Circulation coefficient of floating assets. Efficiency of sales and development of production.3.1. Profitability of sale (%) 3.2. Product imprint ratio. 3.3. Load-carrying capacity of the production.3.4. Commercial Efficiency and Sales Promotion Factor. Product Competitiveness.4.1. Product Price .4.2. Product quality. Evaluation of the production efficiency of the enterprise. This assessment shows the effectiveness of the product sales process, the effective use of fixed assets, the profitability of product sales and the efficient use of labor resources. Evaluation of financial security of the enterprise. This estimate shows the level of the company's dependence on its borrowing costs, the ability of the enterprise to pay its debts and take into account liquidity risks, that is, the level of financial resources available to pay off the existing debt of the enterprise and the effectiveness of borrowing costs of the current period. Efficiency of sales and evaluation of production development. This estimate shows the level of profitability of the enterprise in the market, the level of the product and the demand for it, commercial efficiency and the situation with sales. Evaluation of product competitiveness. This estimate shows the current level of demand for the product. In this case, the method based on product competitiveness depends on the competitiveness of the enterprise and the competitiveness of the product. Competitiveness of the product is determined by the ratio of the product to the price. Change in long-term demand. Increasing or decreasing long-term demand plays an important role in the process of increasing the production capacity of the enterprise. The increase in long-term demand leads to entry of new enterprises to the market and a reduction in demand, which leads to the emergence of business. Such dynamics can change consumer demand, new types of products, new sales channels and so on. leads to. Changes in production include the volume of sales of products in production, production costs, etc. D. has a serious impact. Technological innovation. Continuous technical innovations in production, the amount of investment made will increase the life cycle of the product. This leads to a significant change in the demand for measurement and the number of enterprises that work effectively in the market. Marketing innovations. From a certain point, enterprises start to release their product with the help of a new method of increasing the interest of buyers and reducing the cost of a unit of product. As a result, competing enterprises change their competitive conditions and positions. Change leadership. Large enterprises enter the competitive environment and exit it. In other words, a new competition, the emergence of new large enterprises, a change in market conditions, etc. Dissemination of innovations. When competitors have knowledge about innovations and technologies, they create conditions for unobtrusive entry into a competitive environment. Change in efficiency. The creation of new productivity in production leads to an increase in production volumes and a reduction in costs per unit of output. This forces other companies of large companies to use the strategy of "sustainable growth". Consumer privileges. In many cases, buyers come to the conclusion that cheap products can pay for demand as expensive products. Source: Based on the 2017 report materials of State Statistical Committee of the Republic of Azerbaijan. It should be noted that the group of economic entities in the manufacturing industry did not have sufficient financial support from its own funds and government subsidies, low demand for fresh products, low innovation costs, high innovation costs, high economic risks, including the late payment period. Factors of production include low innovative capacity of enterprises, lack of information about new technologies and sales markets, lack of innovation from the enterprise and lack of cooperation with other enterprises and scientific organizations. Other factors include the need for products that are not the result of previous innovations, the lack of legislation and regulations that regulate and motivate innovation, the uncertainty of the innovation process, innovative infrastructure (mediation, information, law, banking and other services) including low level of evolution. All this makes it necessary to implement a project to eliminate factors that impede the competitive development of the manufacturing industry. It should be noted that to ensure the competitiveness of manufacturing enterprises, this forecast should be controlled by the manufacturing enterprises, enterprises, enterprises and the entire market for 3-4 years. Provision of raw materials and materials for production activity. Long-term investments in investment projects. Improvement of the preparation process of experts, etc. Implementation of new energy-saving and resource-saving technologies. Minimum level of expenditure on labor, material and energy resources in the process of production of processing industry products. Raw material processing through innovation. Introduction of nano technologies, etc. In addition, it should also take into account that increasing investment attractiveness by reducing the risks that may arise in the area of ​​competitive business development in manufacturing and product growth. At the same time, state support should play an important role in increasing the competitiveness of entrepreneurship in the manufacturing industry, its competitive development, increasing innovation efficiency, processing of raw materials and modern technologies. Formation of competitive advantage in priority areas of manufacturing industry. The conformity of the manufacturing industry to the effects of external and internal risk factors. Formation of technological resources for innovative development of manufacturing industry. Stimulation of investments in development of economic and production potential of manufacturing industry, as well as its infrastructure. Abasova S.T. 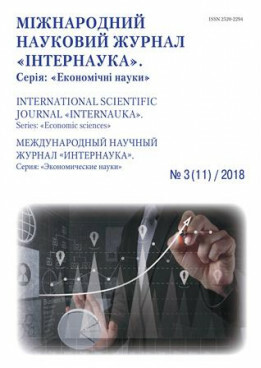 "State support of entrepreneurship", Min.Obr.Az.Resp.AGEU State support of entrepreneurship, Monograph, Baku, Elm, 2009.12 p.
Abasova S. T. "Inter-firm interactions of business entities", "Economics and management: problems, solutions" Scientific and Practical Journal - 7, volume 3. Russia, Moscow, Izd. "Scientific Library", 2017 July. 0.5 p.p. Belosludov, VR, Dyadin, Yu. A., et al. Theoretical models of cluster formation / otv. Ed. VI Belevantsev. - Novosibirsk: Science, Sib. Department, 1991. - 129 p.
Budnikov, GK, Dyachkova, TA, et al. Electrochemistry of polynuclear clusters and heterovalent compounds. - Kazan: Kazan Publishing House, University, 1989. - 94 p.
Clusters of nooeconomy: regional features, methods and mechanisms / under the science. Ed. N.M. Surnina. Ekaterinburg: Publishing house Ural. state. econ. University. 2007. - P. 85. Porter, M. Competitiveness at the Crossroads: Directions for the Development of the Russian Economy / M. Porter, K. Ketels, M. Delgado. - Moscow: CSR, 2007, p. 36. Solvell, O., The Cluster Initiative Greenbook. The Competitiveness Institute / 0. Soivell, G. Lindqvist, C. Keteis II VINNOVA, Gothennurg. 2003. P. 11. The concept of cluster policy in the Russian Federation and the action plan of the Government of the Russian Federation for its implementation in 2007-2008: a decree of the Government of the Russian Federation. 2007 (draft). Tretyak, VP Clusters of enterprises. - M.: August Borg, 2006. - 132 p.